How do multiple stable states influence local and macroscale ecological patterns? Understanding how local feedbacks operate within heterogeneous coastal environments is essential to forecasting marsh persistence and loss in response to sea level rise, river impoundment, and other environmental changes. In coastal lagoons, feedbacks between open water, wind erosion, and stabilizing effects from wetland vegetation produce two states: open water with fringing marshes, and marsh-dominated basins. Unknown is whether, how, and at what scales these feedbacks affect distribution of marsh ecosystems in large, complex estuaries, where macroscale coastal and watershed characteristics control suspended sediment and wind energy. Using a multi-scale geospatial analysis spanning the Atlantic and Gulf coasts of the USA, we show that characteristics of estuaries (depth, shoreline complexity, land use, tidal range, latitude) and their watersheds (discharge) best predict wetland extent at broad spatial scales (~> 102 km2). Bimodal distribution of wetland extent occurs at finer scales (~ 100 to 102 km2) that correspond to the theoretical scale of wave erosion feedbacks. Local feedbacks are thus the mechanism that controls marsh dynamics, whereas coastal and watershed characteristics determine macroscale wetland distributions through their effects on these processes. In coastal marshes, and likely in other complex landscapes, the spatial extent of feedbacks shapes the scales at which local and macroscale processes control the distribution of alternative stable states. 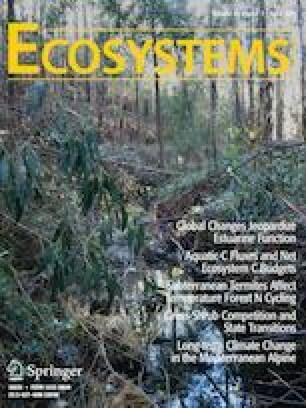 These findings help predict scales at which coastal wetlands will respond catastrophically or continuously to environmental change, and provide a basis for multi-scale strategies to protect and restore coastal wetland ecosystems. Both AEB and JBH designed the study and analysis, interpreted the results and wrote the paper. AEB conducted geospatial and statistical data analysis. All data are from publicly available datasets (see Methods and Supporting Information—Appendix A). All code is available upon request from the authors. The online version of this article ( https://doi.org/10.1007/s10021-018-0332-3) contains supplementary material, which is available to authorized users. The N.S.F. Geomorphology and Land-use Dynamics grant (# 1530233) and North Carolina Sea Grant (# R/MG-1504) supported this work financially. We thank A. B. Murray, M. Marani, M. Kirwan, X. Dong, M. Doyle, F. Yousefi and anonymous reviewers for discussion and review that improved this work. Braswell AE. 2017. Spatial and temporal drivers of coastal wetland formation and persistence. Dissertation, Duke University. Retrieved from: https://hdl.handle.net/10161/16388. Last accessed 10/10/2018. Conservation Biology Institute. 2010. Global Average Annual Surface Runoff, 1950–2000. ESRI. http://www.arcgis.com/home/item.html?id=c5a76c73d0874e4c8d5bdb3bd40f2ed8. Last accessed 01/01/2017. National Oceanic and Atmospheric Adminstration. 2016. VDatum software. https://vdatum.noaa.gov/welcome.html. Last accessed 24/02/2017. United States Environmental Protection Agency, United States Geological Survey. 2012. National Hydrography Dataset Plus Version 2. http://www.horizon-systems.com/nhdplus/. Last accessed 30/06/2014. U.S. Fish and Wildlife. 2014. National Wetlands Inventory. http://www.fws.gov/wetlands/. Last accessed 03/04/2014. Yousefi Lalimi F. 2018. Evolution of coastal landforms: investigating sediment dynamics, hydrodynamics, and vegetation dynamics. Dissertation, Duke University. https://hdl.handle.net/10161/16856. Last accessed 10/10/2018.